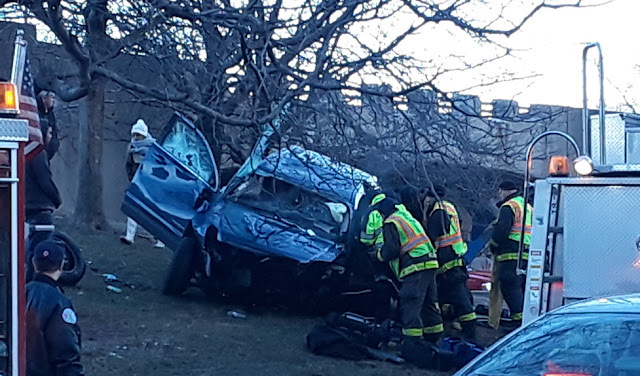 A woman was killed in a single-vehicle rollover crash near Belmont and Lake Shore Drive on Saturday afternoon, police said. No other injuries were reported. The woman’s black vehicle was traveling in the right southbound lane when it slammed into the concrete abutment of the bridge over Belmont Avenue and rolled down an adjacent embankment, according to multiple witnesses at the scene. The woman's vehicle reportedly slammed into this concrete bridge abutment and rolled down the embankment. Firemen used a large strap and hooks to secure the vehicle to a nearby tree to prevent the car from rolling over on rescuers who were working to extract the victim at 3:15 p.m.
Brent Seberhagen captured video of passers-by lending aid to the driver moments after the incident. One man chips at the passenger-side window while another works to open the driver-side. “Thoughts and prayers to all involved,” Seberhagen said via Twitter. The woman was transported to Illinois Masonic Medical Center with critical injuries. She was pronounced dead at 3:57p.m. CWBChicago's coverage is 100% funded by our subscribers. Sign up now for as little as $5 per month.